The satisfaction of directly supporting the LGA in its initiatives to grow the game of golf. Through your support, you’ll continue to help the LGA preserve the true spirit of the game that means so much to us all. Four custom handprinted tumbled marble coasters (with the LGA logo) and a yearly subscription to Golfweek magazine (instead of three-month trial). The coaster set comes with a custom gift box and an iron stand for display. The LGA is the governing body for amateur golf in Louisiana and exists to foster the enhancement and expansion of amateur golf through the development of member and information services, the promotion of opportunities for all who want to play, and the protection of the game’s integrity and valued traditions. 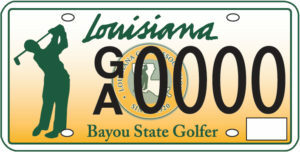 We encourage all Louisiana golfers to consider purchasing the plates now that they are available. In addition to identifying yourself as a “Bayou State Golfer,” you’ll also be investing in our wonderful game in Louisiana. We look forward to seeing the “Bayou State Golfer” license plates proudly displayed on vehicles throughout the “Sportsman’s Paradise” and abroad. The plates will cost an additional $25 annually ($50 for the traditional two-year registration cycle) with the additional revenue generated being invested in Junior Golf and growth of the game initiatives in Louisiana.